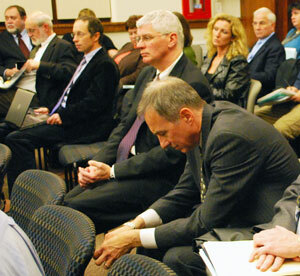 Washtenaw County Board of Commissioners (Nov. 4, 2009): After removing a major item from their agenda – the 2010/2011 budget – county commissioners spent the bulk of their Nov. 4 meeting listening to presentations, reports, and a public hearing. Commissioners also voted and approved a new tax to raise roughly $603,000 annually for economic development. The 0.04 mills will be collected on the December 2009 tax bill. Sheriff Jerry Clayton spoke about plans to reorganize the county’s central dispatch and emergency services operation. Changes include co-location of the county and the city of Ann Arbor’s central dispatch, which will both be housed in Ann Arbor. Commissioners also heard concerns from local restaurant owners and managers – including Ken Weber of Weber’s Restaurant & Hotel, and Rick Strutz of Zingerman’s Deli – during a public hearing on a proposed new food safety training program. But First, What About the Budget? The county administration and commissioners have been working on the 2010 and 2011 budget for about a year, addressing how to deal with a projected $30 million deficit over that two-year period. Bob Guenzel, the county administrator, made his budget recommendations at the board’s Sept. 16 meeting, and the board was expected to make its initial vote at the Ways & Means Committee portion of the Nov. 4 meeting, with a final vote at their regular board meeting on Nov. 18. However, at the beginning of last Wednesday’s meeting, Conan Smith – who chairs the Ways & Means Committee, on which all commissioners serve – announced that the budget agenda item would be pulled. They needed to address a handful of issues that would result in a more “fulsome” budget resolution, he said, to be brought back at the Nov. 18 meeting. Later in the meeting, commissioner Kristin Judge asked the board to have a discussion about retirement benefits, noting that earlier in the year it had been mentioned as one of the options to explore in addressing the budget deficit. She wanted to know what other commissioners thought. Guenzel acknowledged that it had been one of many items mentioned early in the budget process, but that it was a very sensitive area and he had decided not to include it in his budget recommendations. There were some legal issues involved, he said, without elaborating. Also, he said he’d made a commitment to a group representing the county’s retirees, who wanted to be involved in whatever discussions were held. Guenzel said he was hoping to regroup with the board after the beginning of the year to have a discussion about retirement benefits, but didn’t feel they had time to do it before the budget needed to be passed. We remain concerned, however, that all County employees continue to receive defined benefit retirement plans. As experience has shown, future liabilities associated with such plans are unsustainable. The time is ripe to explore alternatives, to shift to defined contribution plans akin to those of the private sector. We are aware that the Board of Commissioners recently chose to levy a 0.04-mill tax to fund economic development and agricultural activities within the County. We insist that no general fund revenues be used to supplement these monies while this tax remains in effect. As the County moves forward, we urge it to focus on funding its core, mandated functions and, in order to maximize that funding, to continue to seek efficiencies in service delivery. For instance, the County should continue to pursue successful partnerships and shared/regionalized services with the 28 local units of government within its boundaries. There is needless redundancy and duplication; there are economies of scale yet to be realized. The County and City of Ann Arbor data center merger circa March 2009 is a prime example of the success to be had. We also urge the County to continue to plan in light of uncertain economic times ahead. For example, in this budget cycle outside agency contributions were restored, to a certain extent, contrary to the County Administrator’s recommendations. Should such contributions need to be revisited in future budget cycles, contingency plans should already be in place. Sheriff Jerry Clayton gave a presentation about their plans, reminding the board that they had previously approved shifting the emergency management division to the sheriff’s department. Now, the department was planning to combine that unit with central dispatch – the group that handles 911 calls – to create an emergency services division. The idea was to create a more efficient operation and provide better service, Clayton said. At the same time, the county’s central dispatch is moving ahead with a project to co-locate its operations with the city of Ann Arbor’s central dispatch. Ann Arbor has sufficient space within its existing facility – on second floor of Fire Station #1, across from city hall – to handle both dispatch operations, though some remodeling is required at their facility, Clayton said. In addition, Ypsilanti has expressed interest in contracting with the sheriff’s department to handle its dispatch service, he said, describing those discussions as preliminary. Long-term, it might make sense to have consolidated services for the entire county, “but you can’t do it all at once,” he said. To pay for the move, Clayton said they planned to ask the county’s 800MHz project implementation committee for $324,275 in funding. The committee oversees funds from a millage to develop a countywide emergency radio system. The changes, Breckenridge said, would provide cost savings in several ways. It would reduce the need for two 800 MHz consoles, which would save $290,000. The county would also save $450,000 that it would have otherwise needed to spend on a new microwave data link to the new 800 MHz system, he said, as well as $74,000 for a replacement audio recording system. The county would also not be required to spend $350,000 for a new telephone switch. Over the years, Breckenridge added, co-location will save in the cost of doing business, because of shared technology expenses. A lot of technology is duplicated among various units of government, he said. Clayton said the whole project was an example of the county and city of Ann Arbor’s willingness to work together, leveraging resources with the goal of improving public safety. Rolland Sizemore Jr. asked why they were using Ann Arbor as the co-location facility, and not the county’s operation on Hogback Road. Clayton responded that Ann Arbor’s space was larger, with room for expansion that the county did not have. How much would the county have to pay Ann Arbor? Sizemore asked. That’s still being negotiated, Clayton said. Leah Gunn said she was a member of the 800 MHz committee and would do everything she could to make sure that their funding request was seriously considered. Barbara Bergman noted that in the past, objections from the union had been a barrier to reorganization. How had that been overcome? Clayton said that they worked closely with Diane Heidt, the county’s human resources and labor relations director, who had helped guide them through this process. It was important that nobody lost their jobs, he said. The three supervisors can take voluntary demotions, or apply for a dispatch coordinator job. Wes Prater asked what kind of backup system they had, if the co-located facility went down. Breckenridge fielded this question, saying they’d keep a small standby system, which could be operated on generator power, at the county’s current Hogback Road dispatch facility, where the emergency services office is located. Kristin Judge asked how the co-location would actually work. Initially, Clayton said, they’ll start with two separate operations, except for some supervisory work. Over time, he expects to see more sharing of resources. Clayton clarified for Ken Schwartz that there were nine dispatch locations – Ann Arbor’s and the county’s are the largest two. Does this move lay the groundwork for others coming into the co-located facility? Schwartz asked. Clayton said he hoped so. Jeff Irwin noted that they’d been talking about co-location for at least a decade, and that he hoped this was a step toward consolidation. Later in the meeting, commissioners unanimously passed the resolution authorizing the reorganization of central dispatch and emergency services. It was not a unanimous vote, however. Commissioners Kristin Judge and Wes Prater voted against the millage, and Mark Ouimet voted only for the portion of the millage that would be allocated to 4-H, Michigan State University Extension programs, and the Food System Economic Partnership. Several people spoke during Wednesday’s public hearing on the topic – all but one of them questioning the need for such a program. Kyle Mazurek: Mazurek, vice president of government affairs for the Ann Arbor Area Chamber of Commerce, said the chamber had several concerns about the proposed program. He wondered whether the program was intended primarily to generate revenues for the county. Fees should be used only to cover the costs of administering the program, he said. Mazurek asked whether there was a documented need for the program, and said he’d heard from many in the industry who don’t believe there is. Finally, he said there was some question about who would pay for the fee, and that conventional wisdom held that it would be the employees who’d bear the cost. The chamber would be looking into this further, he said. Ken Weber: Weber, president of Weber’s Restaurant & Hotel, began by praising the county health department, saying that the staff worked well with local restaurants. He said he believed in the importance of raising the level of sanitation, but wondered whether the new program would achieve that goal. It was his understanding that there’d be no test for people who took the training, for example, so there’d be no way to know if they’d paid attention and learned anything. Weber also said that the program would create a bad situation for his employees, because he’d have to let them go if they didn’t have a food safety card. Finally, he didn’t think it was fair to require that experienced, long-time employees go through the same program as 17-year-old kids. Ultimately, it didn’t seem like the program would achieve the results they were looking for, Weber said. Kevin Gudejko: Gudejko is director of operations for Main Street Ventures, which owns several restaurants in Ann Arbor, including Gratzi and the Chop House. He noted that current regulations require one manager at each food establishment to be certified in food safety – it’s a struggle to meet that requirement, he said, and many restaurants in the county haven’t done it. The program could also be a barrier to employment for people having to pay the $15 fee to get the food safety card. It would create a competitive disadvantage for Washtenaw County businesses, he said, since potential employees might choose to seek jobs in neighboring counties, where no such regulations exist. Finally, Gudejko said he was concerned about language barriers – one of their employees is from Jordan and is struggling to complete the certification class. Patrick McDevitt: McDevitt is general manager of Mancino’s Pizza & Grinders in Saline. He also mentioned the county’s requirement that at least one manager be certified in food safety. Through that process, he noted, managers are taught about foodborne illnesses and other safety issues, so that they in turn can teach their employees. Why require that managers get certified, he said, then essentially say that their training isn’t good enough to teach employees? Rick Strutz: A managing partner at Zingerman’s Deli, Strutz said he didn’t know of many things more important than food safety. He thanked the public health staff for their work on the H1N1 vaccines – that virus affects the food business in a big way, he noted – and said it was a department that genuinely wanted to make things better. While agreeing with the goal of better food safety, Strutz said this wasn’t the proper path. Zingerman’s already requires that employees take a class on food safety and pass a test – they’re taken off the schedule until they can pass it, he said. Yet with 500 employees, it’s difficult to keep track of who’s taken the test, to schedule times for the class, and to find people to translate the tests, which are frequently updated. About 10,000 people countywide would be required to get the food safety card, and Strutz wondered how the county would be able to regulate that program effectively. He noted that Zingerman’s had spent about $30,000 to send its managers to be certified in food safety, as required by the county. But that certification program – a much smaller one than what’s being proposed – isn’t being regulated, he said. Strutz also suggested that if the county were merely interested in generating revenue, they should consider simply increasing the restaurant licensing fee instead. Andy Deloney: Deloney is vice president of public affairs for the Michigan Restaurant Association. He came at the urging of several association members in the county, and asked commissioners to consider their concerns. The restaurant industry is one of the largest employers of young people, and he was concerned that this program simply added to the cost of operations while providing little public health benefit. Deloney told commissioners that they were in good hands – of the 54 county health departments in the state, Washtenaw County’s is highly regarded, he said. Thomas Partridge: The only person to speak in favor of the program, Partridge said that it should not only be a countywide program, but should be implemented throughout the state and nation. Employers, not their workers, should pay the entire fee, he said. Kristin Judge, the Pittsfield Township commissioner who is championing this program, thanked the food proprietors for coming to the public hearing, but said that she had a different perspective because of her own personal experience. She got training through a similar program when she was a waitress in Arizona years ago, and learned valuable information that helped her at work. This wasn’t about generating revenue, she said. A lot of restaurants in Washtenaw County weren’t doing as good of a job as those represented at the public hearing, she said, and there was still a lot of education needed in the local food industry. As for the $15 fee, it was the equivalent of a tip on a $100 tab, she said, and wouldn’t be a burden. She told the restaurant managers that because it was new, they might not yet understand the value of the program. Commission Jeff Irwin said he knew that several people who wanted to speak about their concerns at the hearing had to leave before it was held, because of the late hour. [The public hearing occurred toward the end of the board meeting, around 8:30 p.m.] There’s a high failure rate in the restaurant business, he said, and adding one more regulation was something the board should think about carefully. He asked whether this requirement would demonstrably improve food safety in Washtenaw County – was it the right tool? He wasn’t convinced that it was. A better approach would be to work on strict yet consistent enforcement of the county’s current regulations, Irwin said. He hoped the board didn’t want to move forward at breakneck speed – it would affect a lot of people, and many don’t even know it’s being considered. Commissioner Mark Ouimet said that he consulted with his daughter, who manages several high-end restaurants. She told him that government ordinances don’t affect how they do business or how they set their standards, which are high. He said he wouldn’t be supporting this program. Rolland Sizemore Jr., the board’s chair, said he’d talked with waitstaff in several small restaurants – they’d told him the proposed program was a good idea, but he wasn’t so sure. He wanted to see more dialogue between the health department and restaurants of all sizes. Sizemore also wasn’t comfortable with the fee, saying that the economy was bad, especially for people who were just entering the workforce. He said there was no need for the board to be in a hurry about this. Responding to her colleagues’ comments, Judge said that it’s a public health issue. Until all restaurants in the county get perfect inspection scores, they need to do more. She said she’d try to get data about the effectiveness of programs like this, and report back to the board. Several commissioners asked questions about the H1N1 situation. Barbara Bergman asked if there was a hotline that people could call for information. There is: 734-544-6700. Conan Smith jokingly asked if they had brought samples of the vaccine for commissioner. They hadn’t. Torres-Burgos wrapped up their presentation by saying that it’s going to be a very long flu season, and very challenging. individuals 25-64 years old who have medical conditions that put them at a higher risk of influenza-related complications, such as chronic lung disease, weakened immune systems, cancer, diabetes, kidney or liver disorders, cardiovascular disease and other conditions. In addition to the public commentary described above, Thomas Partridge spoke during three additional times set aside for public comment. Partridge said the county needed to submit more grant applications to raise money for fair and equitable housing, transportation, public health, job training, and education for all residents. He also called on the county to treat the H1N1 situation as the emergency that it was. They needed every health provider and health provider employee to enlist in a voluntary effort to provide vaccinations, not just for H1N1, but also vaccines for the conventional flu and pneumonia. Finally, he questioned why the commissioners failed to provide the necessary leadership to pass the countywide school millage, which was on the Nov. 3 ballot and rejected by voters. Next board meeting: Wednesday, Nov. 18 at 6:30 p.m. at the County Administration Building, 220 N. Main St. The Ways & Means Committee meets first, followed immediately by the regular board meeting. [confirm date] (Though the agenda states that the regular board meeting begins at 6:45 p.m., it usually starts much later – times vary depending on what’s on the agenda.) Public comment sessions are held at the beginning and end of each meeting. The food safety program as proposed is a sham. How do you improve public health of the public isn’t sick? How did this get proposed without supporting data aleady available? Ms. Judge seems to think that a $15 fee is equivalent to a tip on a $100 meal – I guess we know where she eats AND doesn’t tip well. It is my prediction that the food handlers’ card idea won’t fly. The restaurant owners were very eloquent about the bureaucratic obstacles involved. You are right – thank you Jeff Irwin! The inspection fee sounds like another hidden tax, that will certainly be passed on to consumers. Not to mention the handful of local restaurants, including a couple on the westside of Ann Arbor, who openly use illegals who haven’t taken safety training and no doubt wouldn’t be getting this certification either. That would make for an interesting story or investigation by the county…in the same of food safety, but don’t hold your breath. Seems like a solution in search of a problem. BTW, are the restaurant inspections recorded anywhere these days? Thank you Public Health Department! There is so much respect in this community for our public health department. If the food handler program idea was brought to the board, I trust the judgement of our professional staff to understand that there is a health concern. The county is charged with restaurant inspection and food borne illness prevention. The conversation the board had about the food handlers’ course was not a vote! This was the beginning of dialogue, and I am thankful to hear the comments of the writers here. I encourage public dialogue and will continue to do so at the board table. What happened after the meeting is important to note. I met with the restauranteurs and our Director of Public Health. Noting the concerns of the board, food servers and business owners, we have promised to meet again to come up with a solution that works for all the parties involved and keeps the public safe. Brian, the $15 cost would not be charged to the business, therefore, it would not need to be passed on to the customer. Lorie, I never leave less than a 20% tip because of my many years of working as a waitress. Unfortunately, I am not an average tipper. The 15% I mentioned is more common. If I go out to dinner with my family in downtown Ann Arbor, which I try to do as a way to “shop local” it is easy for a family of four to spend at least $50 on dinner. When we eat out, I notice many tables with more than four people and alcoholic drinks that could easily bring a tab up to $100. Is it wrong for people to eat out? I am not sure why my example was seen as something open to criticism. It comes down to our responsibility for the safety of residents. If you want to be a nail technician or dog groomer, you need to take a safety class and pay a fee because the work you do could harm someone if you are not trained well. The same goes for food workers. If anyone wants to talk to me personally, feel free to call me at 734-646-2088. I welcome your thoughts.